Free Shipping Included! Prestige Import Group Napoli Humidor by Prestige Import Group at Blog Free Here. MPN: NAPLI. Hurry! Limited time offer. Offer valid only while supplies last. An exotic beauty, the Prestige Import Group Napoli Humidor is made of high-gloss walnut burl wood with a Spanish cedar lining for premium quality. 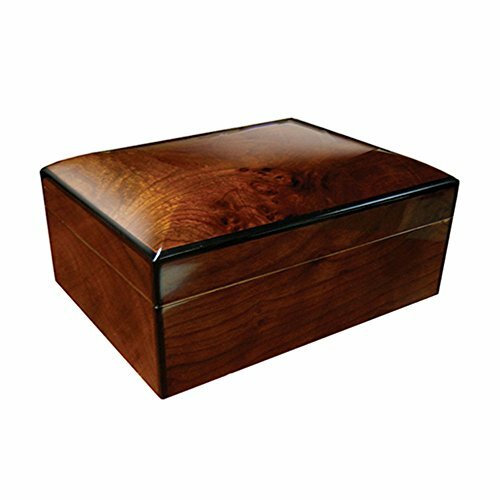 An exotic beauty, the Prestige Import Group Napoli Humidor is made of high-gloss walnut burl wood with a Spanish cedar lining for premium quality. Internal locking hinges and an adjustable divider make it handy. This humidor keeps 75 cigars in perfect condition by its humidifier and hygrometer inside. Holds 75 cigars under a domed lid. Spanish cedar lining and high-gloss walnut burl wood. Locking hinges, adjustable divider. Humidifier and hygrometer. Dimensions: 12.5W x 9.5D x 5.5H in..
Dimensions: 12.5W x 9.5D x 5.5H in.